Think Up was commissioned by the Royal Academy of Engineering to research and write three best practice guides on the teaching of engineering in higher education. This report identifies the common challenges encountered when industry gets involved in engineering education and makes recommendations for the steps that professional institutions, companies and universities can take to make the most of these collaborations. The Royal Academy of Engineering’s report Engineering Graduates for Industry highlights the need for a radical increase in the involvement of industry at national and local levels in engineering education to ensure that undergraduate degrees are fit for the future, meeting the needs of industry and the expectations of students. 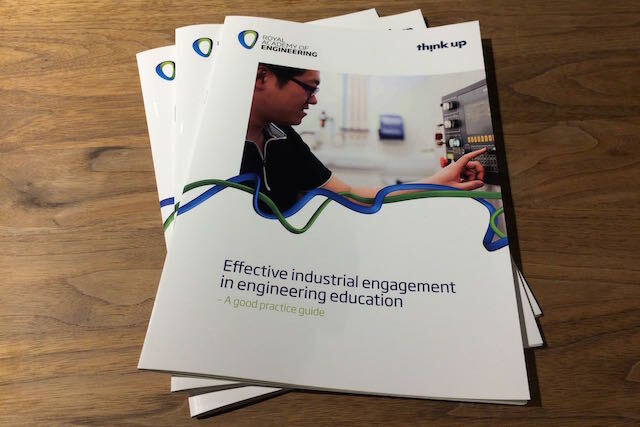 The purpose of this guide is to supplement the strategic guidance and case studies provided in previous studies with practical, workable suggestions for universities, industry and professional engineering institutions to help them deliver and benefit from effective industrial engagement. The guide begins with a brief description of current state of practice in industrial engagement in engineering education, and observes that quality and quantity of industrial engagement initiatives in engineering education is highly variable. The authors attribute this variability to a wide range of challenges encountered by frontline staff: challenges to do with motivation and skill; the challenges of insufficient capacity or funds; and challenges of cultural and organisational difference. To help frontline staff at universities, in industry and in professional institutions overcome these challenges the authors propose a series of principles to be applied in the development of industrial engagement initiatives. The first three principles are written for professional engineering institutions, and say that they should foster relationships between industry and academia; they should coordinate industrial engagement activities; and that they should use their archives to support industrial engagement. The next three principles say that industry, in turn, should develop staff motivation and skill for engagement in engineering education; should make real materials and resources freely available; and should invest in engagement activities. The last two principles say that universities in turn should develop motivation and skill for industrial engagement in engineering education among their staff; and they should make strategic use of academics’ and industrialists’ time. In the body of this guide, these principles are each explained in more depth and accompanied by practical suggestions for implementation.